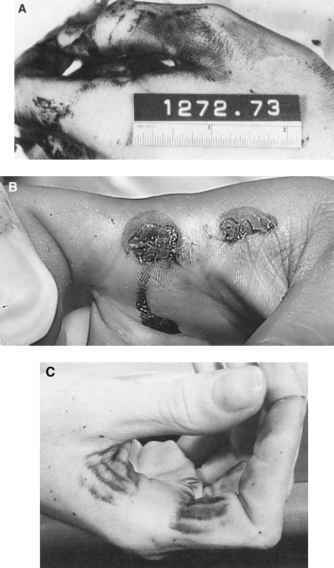 Occasionally a bullet recovered at autopsy will show no rifling on its surface. Lack of rifling indicates that the weapon is a zip-gun, a smooth-bore handgun, or rifle, or a revolver whose barrel has been removed. Zip guns have been previously discussed. Weapons intentionally manufactured with smooth-bores are almost all .22-caliber rifles made for the exclusive use of .22 shot cartridges. Rarely, weapons that are supposed to have rifled barrels, inadvertently, get out of a factory with smooth bores. Absence of rifling in a smooth-bore weapon does not indicate that a ballistic comparison cannot be made. The author had a case in which an individual was shot with a smooth-bore .22 rifle in which there was enough pitting of the bore to produce striations on the bullet, thus making possible a positive comparison with test bullets fired down the barrel. 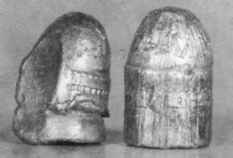 Figure 10.5 The bullet on the left is shortened, shows the absence of rifling, and has one side sheared off compared to the bullet on the right which emerged from the barrel.